It's been a week since I ran Canyons 50K and I'm still high on life. The race went better than I could have imagined! Now that you have the outcome, let's back up to how the weekend and race played out. Kevin and I took Friday off and drove to Auburn in the early afternoon, going straight to Auburn Running Company to pick up our bibs and swag. Kevin was running the 25K while I was doing the 50K, so we both got the awesome Canyons trucker hats. I love hats, and this is now one of my very favorite ones! 50K and 100K runners received both the shirt and hat, while the 25K and 10K runners chose one or the other. 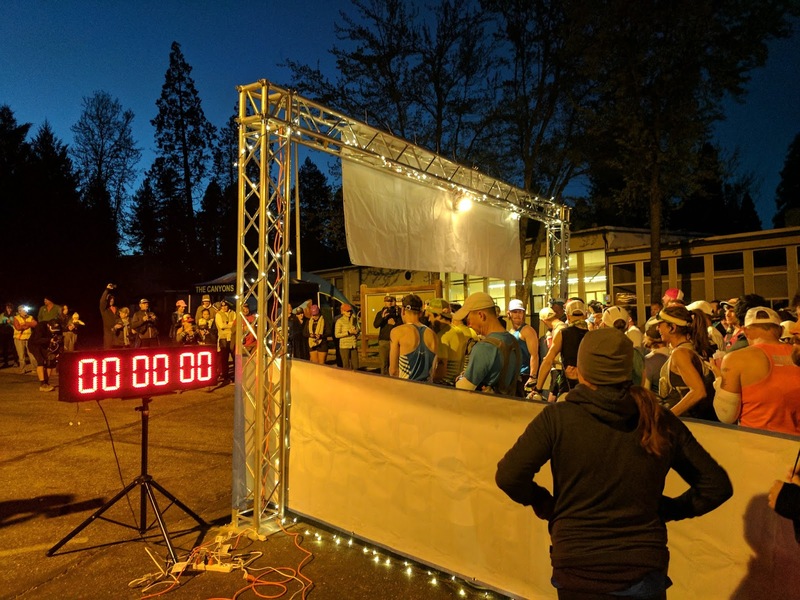 The 25K and 10K were added this year as a fundraiser for the Foresthill schools and the Western States trail, and it turned out to be a great way for family to participate in the race weekend while supporting 50K and 100K runners. Trying on the new hats! We had a lot of the day left to hang out in Auburn after picking up the bibs, so we visited Moonraker Brewing and I let myself have one low ABV beer. This is one of my new favorite breweries and I would have loved to keep trying new things, but alas that doesn't work well the day before a race. Later we checked into the hotel, rested in the room for a while, and went out for pizza. During dinner, I realized that although I had carefully calculated how many small-serving Tailwind packets I needed and packed them into my hydration pack, I had not brought the large Tailwind package for the first fill in the morning. Doh! Luckily, Fleet Feet Roseville was only 20 minutes away and had plenty in stock. I definitely didn't want to go into a race having to worry about being short on my preferred fuel. By the time we got back from Roseville, I was ready to attempt sleep. It was only around 8:30 pm, but the race started at 5:30 am and we'd be setting the alarms for 3:45 am to get there in time. I slept well and woke up feeling ready to roll when the alarm went off, thank goodness! That was a huge fear I had with the early race start. I got ready, ate my oatmeal, and headed out the door to Foresthill. We were able to go inside the school while waiting and to use the school restrooms, which was nice because it was a little chilly outside. I ran into quite a few people I know from the trail running community and chatted with them until the start. In fact, we didn't even hear them start the race. People started moving and we followed. We started by running on pavement for about 1.5 miles until reaching the trailhead. Once we arrived, there was a pretty big bottleneck that lasted until we crossed Coyote Creek just before mile 3. We stood still for about 10 minutes while waiting to cross, and I was very chilled. Crossing the creek itself was super cold; the water was above my knees and moving fast, but they put up cables and had volunteers there to help. The other side of the creek took us on a 2 mile climb and I warmed up quickly. We arrived at our first aid station, Michigan Bluff, at mile 6.2. I made a big mistake here and waited for the porta potty, which took much longer than I expected, causing me to burn about 7 minutes. I'd been planning to stop at this one because my morning didn't go as preferred with respect to the restroom, and I had no idea what was coming up in terms of off-trail access. When it started to be a long wait I considered leaving, but by then I'd already invested a few minutes into the line and decided to stay. I headed out of Michigan Bluff, completely beating myself up over the decision for the next couple of miles. Eventually I managed to let it go - it was over and worrying about it was only going to throw my mental game into a tizzy. Michigan Bluff to El Dorado was an enjoyable downhill on beautiful single track trail. I arrived at the El Dorado aid station (mile 9), filled my front bottles (one water, one Coke) and started up the next climb: the 4.5 mile uphill and 2500+ feet of vert to the Pump. I used the Coke as a motivational tool and gave myself permission to have a sip only when I hit specific mile goals. This climb turned out to be better than I expected. Yes it was long, but there were some very pleasant runnable parts and the views were great! The elevation profile, from my Strava upload. 9000+ feet climbing total. The Pump aid station (mile 13.5) greeted runners with unicorns and rainbow decorations, including a guy wearing an inflatable unicorn. It was fantastic! I used this aid station to refill my Tailwind; even though my pack was only half empty, I wanted to be fully stocked for the Devil's Thumb portion of the course. I wasn't drinking as much as I expected and I felt great, perhaps because it hadn't been hot in the morning. I left the Pump and soon arrived at Devil's Thumb (where the Western States aid station is located,) then headed into the canyon. As soon as the canyon came into view, I started to get tears in my eyes and felt extremely happy to be in that spot. I'd been waiting so long, hearing about the canyons, wondering what they looked like. And I was there! Quickly, I made myself stop tearing up because if I cried that would really mess with my ability to breathe and I needed to keep moving. The trail down to Swinging Bridge kept going way farther down than I realized it would. It was tough terrain, making it very slow for me even though it was downhill. I arrived at the bottom, grabbed my Hoka bracelet to prove I was there, and immediately started back up the Devil's Thumb climb. The climb is extremely hard and it was definitely hotter at that point. I thought of all my Western States friends who climb that same trail 45ish miles in when it's over 100 degrees. I remembered how Devon had been struggling when I saw her at Last Chance, and how she went straight into this climb and finished the race strong. If they could do it in those conditions, I could absolutely do it in easier conditions! I caught up to a couple of people I know from the Bay Area and enjoyed chatting while we finished the climb. Devil's Thumb. I was moving slow, why not snap a photo? Another view on the Devil's Thumb climb. I went through the Pump aid station again (mile 18.5) and refilled my bottles with Coke and water. Somehow shortly after the aid station I missed a turn to the left, instead following the fire road straight ahead and downhill for a few minutes. I realized it when I saw someone running on a trail to my left, turned around and went back up the hill to take the correct turn. Gah! Luckily, it was only a 5-6 minute detour. I did the same thing right after an aid station during my first 50K, and I'm taking this as a lesson in paying closer attention after losing focus at aid stations. The course is an out-and-back, so it was time for the downhill direction of the 4.5 mile climb we'd done earlier. It felt like the longest downhill ever, and my legs were more than ready to go uphill again by the time we reached El Dorado aid at mile 23. Or so I thought. The climb back up to Michigan Bluff was only 2.8 miles, but it felt like it would never end. 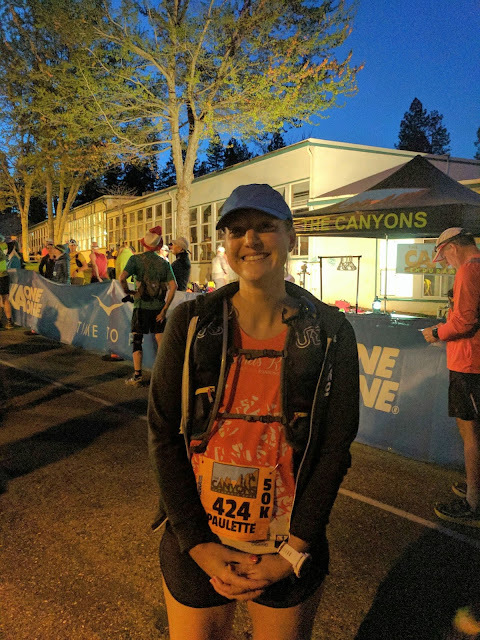 We were now going the same direction as the Western States race, and I remembered how desperately I had wanted to know where the runners came from while waiting to crew at that aid station. I was on the same trail, and that gave me so much motivation to keep climbing. Arriving back at Michigan Bluff (mile 25.8) took away any and all mental doubt the climb had let in. This was the last aid station, and I was 6.2 miles from the end. I finally let myself think about the finish and that I was really going to make it! The final 6.2 miles of the 50K went up, down, and up again for a total climb of about 1000 feet, so it wasn't an easy path to the finish. It had also gotten much hotter. Jenny had told me to fill my pack at Michigan Bluff even though 6.2 miles might not sound like that far, and I'm so glad I listened to that advice! I filled the pack not only with more Tailwind, but also ICE. Having cold Tailwind to drink on the last climb was fantastic! When we crossed Coyote Creek again I knew we had less than 3 miles to go - I kept going as fast as I could. Now I wouldn't say that was particularly fast, but I gave it what I had left. We went back onto the pavement with about 1.5 miles to go and continued climbing on Bath Road. I power walked until I hit the top and then picked up the pace to a run. I considered trying to run up the hill, but honestly power walking was way more efficient at that point. Bath Road to Foresthill felt longer than I expected and I was ready to be done. 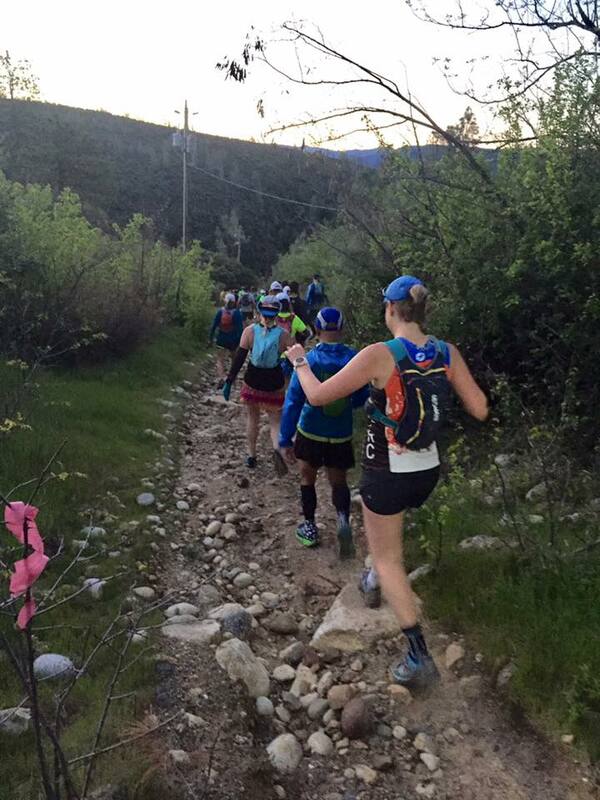 I remembered Western States runners and how they would be running that segment at mile 61. I thought about Kevin going to meet Matt as he came onto Bath Road when we crewed for him in 2014, and how strong Matt looked when he got to Foresthill. I thought about Mike from Striders, who struggled through that section big time but pulled out of it to finish strong later in the race. Yes, I most definitely could run it in at mile 31 with only 1 mile to go. Approaching Foresthill was really fun. People were cheering, I saw Alisyn and Matt, and Chris gave me a high five on the way into the chute. I crossed the finish line in a time of 9 hours and 10 minutes, about 20 minutes faster than I expected. I was so happy! I was overwhelmed with excitement and ecstatic to see friends at the finish. A huge thank you to Kevin, Jenny, Chris, Alisyn, Matt, Charity, and everyone who was there to cheer and celebrate. 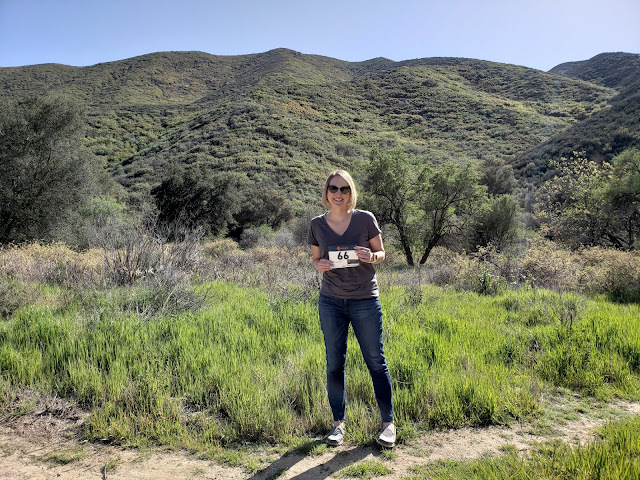 Also, a big thank you to all of the volunteers and especially to Striders Mandie and Kim, who were out there volunteering at Michigan Bluff and later sweeping Devil's Thumb. It's always wonderful to see people I know along the way. In addition, thank you to everyone who messaged me, commented on posts, and supported me as I trained for Canyons. It means more than you know! After finishing, we stayed for a while to see the 100K winners come in and to enjoy the BBQ. I received a Canyons pint glass for finishing, which I promptly filled with the beer provided by the race. They gave me a hat, a pint glass, and beer? This race was a match made in heaven. Showing off the pint glass. Overall, Canyons went extremely well. In some ways I feel I got lucky, but I also know I worked my tail off and was very well trained. For once, my body AND my mind were ready for the challenge at the same time. I went into the race excited, I drew on desires to see the trail and the strength of friends when it got hard, and it was a huge success. Last, I want to acknowledge that most of the runners continued on to do yet another 50K after I finished. I was ready to be done, and that blows my mind. 100K runners, you are incredible! Congratulations on a great race!! And any race that provides beer and the glass to put in takes the cake. I love the hat, pretty colors. *Almost* makes me want to attempt a 50k. I hope Kevin enjoyed his race too! Congratulations, Paulette! It sounds like this race was made for you! I am so glad you had a great day. That course looks so brutal. Thank you, Marilyn! I really loved it. The course is brutal for sure, but worth it! Great recap! And congrats! I know what you mean, I still get emotional out on those trails even though I run them often. Huge respect for them and the history behind those trails. Thank you! And congrats to YOU as well! I love the history of the trails, it's so amazing. Ah Paulette, you're amazing! Congrats on a killer training block (kudos for finding a coach who is great for you) and on what sounds like a magnificent race. So stoked for you and proud of you, girl! High ten all around!